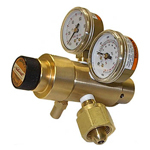 Miniature/Lecture bottle 2500 Series single stage regulators in brass, stainless steel, aluminum or monel. They can regulate a broad range of media compatible with materials of construction. Standard Features: Cartridge Style Valve Assembly with Integral Filter, Machined Barstock Body, Threaded Bonnet Vent Port, Panel Mounting Optional, Economical Design. SERIES 4500: 4500 Series two stage regulators in 316 stainless steel, brass or nickel plated brass, aluminum or monel. They can regulate a broad range of media compatible with materials of construction. 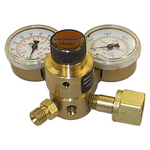 Standard Features: Cartridge Style Valve Assembly with Integral Filter, Machined Brass Barstock Body, Economical Design.